Three complete TOEIC practice tests with listening and reading sections. BONUS Management Trainer for Speaking and Writing Trainer contains an extra 40 speaking and 20 writing exercises to help you practice these difficult sections of the test. BONUS TOEIC Businesss Trainer with an extra 1,300 reading and listening questions customized to your English level and designed to help you improve. 1. Flash Media Player version 8. Download and install the player here. 2. A microphone or headset. 4. Click here to check your video and audio settings. Enter your user name and e-mail address to take a free TOEIC test simulation and find out your score. Each test simulation takes about 30 minutes. The top 10 scores each month are eligible to win an iPod. See TestDEN Challenge for more details. There are three complete and different versions of the TOEIC Practice Test. These practice tests have a timer function, just like the real TOEIC. The Practice Tests include high-quality audio and images programmed in Flash. Each practice test exactly simulates the testing questions for reading and listening. Featuring 40 speaking and 20 writing exercises to help you eliminate any weaknesses with speaking and writing. Each exercise includes a model answer for your review. This program is like no other! You will begin with a diagnostic pre-test which tells our program what your weaknesses are and what areas you need the most help with. Then, based on this information, TOEIC Business Trainer designs the perfect training program for you. Using this program, you will see dramatic improvements in listening and reading. 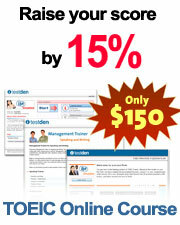 You will take two practice tests and complete 12 daily training sessions with 1,300 questions.